Ward 7 and 8 residents, Community College Preparatory Academy (CC Prep) has two locations in Ward 8. 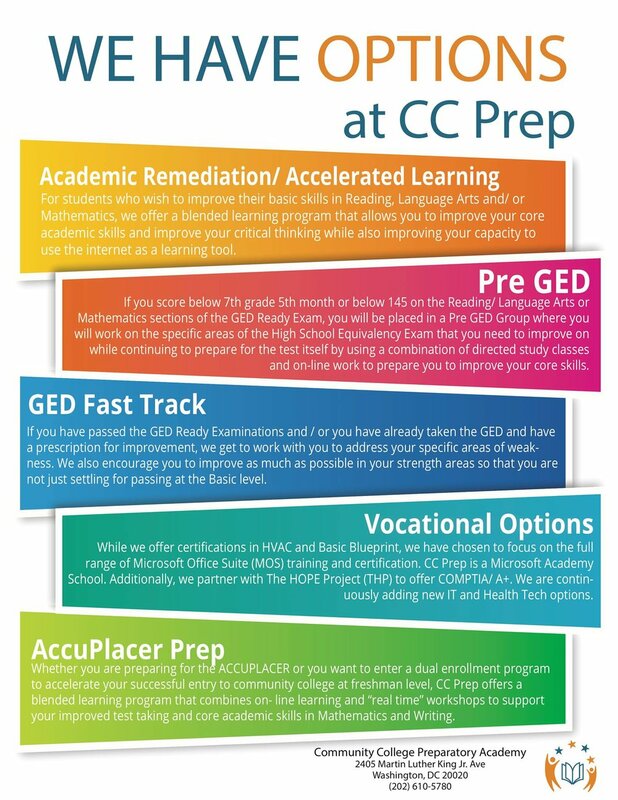 If you need help getting your GED, getting prepared for college or are looking for a skill that can provide you with a lifetime career and not a low paying job then you need to contact CC Prep today. No time like the present! CC Prep classes are free to DC residents, come with support and have flexible class schedules. This is your chance, can you afford to delay? Call now and you could be in class this week! And mark your calendar for these upcoming awareness sessions. Bring your friends, family, neighbors etc. and learn more about the opportunities with CC Prep. They are here to help you! Sessions are at 12pm and 4pm and are free and open to DC residents.